The confluence of Say on Pay (SOP) votes and heightened scrutiny plus the influence of proxy advisory firms (particularly ISS) are having a major unintended consequence—the movement to “one size fits all” or homogenization of executive compensation programs. It is true that SOP votes have encouraged some valid governance enhancements, for example, significantly more shareholder outreach by many large companies. However, in order to minimize the potential for a negative SOP vote outcome, many companies are changing their pay practices based more on potential external views than business/talent needs. This is particularly apparent in the design of performance share plans with the increasing use of relative TSR (at nearly 50% prevalence). 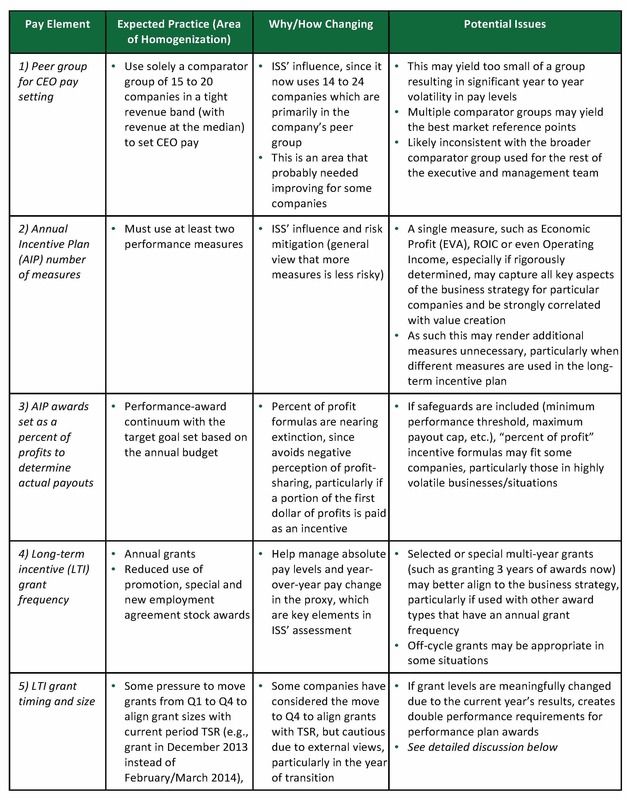 Below we summarize other areas of the executive compensation program that are exhibiting homogenization, the resulting risks and potential steps companies can take to preserve/maximize the linkage to a company’s business strategy and talent needs. There is a wide range of practices that have converged or are converging which may not best align to a company’s business strategy or cost effectively support its need to motivate, attract and retain highly-qualified executives. Below we focus on incentive plan elements that are exhibiting homogenization. We want to emphasize that some of the new homogenized practices may be perfectly acceptable for a given company or group of companies in a given set of circumstances, but it is unlikely that such uniformity is ideal for the large number of companies conforming due to external pressure. With the focus of ISS and many shareholders on the grant value of long-term incentives, as reported in the Summary Compensation Table, some companies are considering granting awards at the end of the current fiscal year to cover the next year’s LTI grant. Currently the vast majority of companies grant LTIs in the first quarter, after the start of the performance period but, of course, before the year-end TSR results are known. However, this leads to the risk for the grant levels to be perceived negatively due to the company’s stock price performance the rest of the year, specifically the full year TSR (even though specific prospective performance goals must be achieved in order to earn much of the award opportunity). In this regard, annual SOP votes and ISS’ current assessment approach may result in more companies considering the shift to grant LTI awards prior to the end of the year (December for calendar year-end companies) versus waiting to make grants shortly after the start of the year (February/March). This would allow the compensation committee flexibility to appropriately manage the amounts in the Summary Compensation Table (SCT) disclosure with the LTI grant date values typically varying within a reasonable range to market-based guidelines. The granting of LTI awards in December may be positive or negative, depending on the impact on the market-based grant guidelines and other factors, as well as your point of view. It would, however, create more “control” in the proxy-reported grant value of a given year’s stock grant and allow companies to consider year-end TSR results. However, the current “Q1 granting model” has not been a failure that needs an overhaul. If companies are considering a change in grant timing they should carefully consider if moving the LTI grant timing to Q4 is appropriate, particularly given the various implementation considerations. Such a transition (to Q4 of the current year from Q1 of the subsequent year) can be challenging for both LTI recipients and shareholders (proxy optics), depending on the implementation approach (e.g., double grant year, delay the next grant, etc.). If this change is made, companies should determine the appropriate application of the current year’s performance in determining LTI grant levels. Since the typical focus of shareholders and ISS is on the CEO position, the variance of LTI grant levels based on the current year’s performance could be limited to the CEO. However, this would result in design and, potentially, award mix differences between the CEO and the rest of the executive team. There is a market trend to use relative TSR as the sole or key performance metric for long-term incentive performance plans. The move by an increasing number of companies to implement identical performance share plans using relative TSR may be right for some of them, but could be problematic for others. Relative TSR is often replacing a broad portfolio of metrics including profitability, cash flow and capital returns, which are key metrics in the business strategy. This change may have negative consequences on executive motivation and possibly encourage excessive risk taking. Of course, absolute stock price appreciation -- and for context, relative TSR comparisons -- are the ultimate arbiters of long-term corporate success. Clearly, many shareholders and ISS use them to measure how well companies are performing. But that is different from having relative TSR be the actual incentive metric for a large proportion of an executive’s pay package at so many companies. ISS’ current quantitative voting formula relies primarily on relative TSR, and the SEC has encouraged showing relative stock price performance in the proxy over the years. While ISS says it is not prescribing performance metrics, hundreds of companies have interpreted these regulatory pressures, probably correctly, as the equivalent of a mandate to use relative TSR as an incentive metric. How dramatic is the change to relative TSR? 1. Over the past 10 years, the percentage of companies with LTI performance plans has risen from roughly 30% to 70% and growing, with even higher prevalence in some industries. 2. Performance plan grant sizes have grown as well to approximately 50% of the value of CEO LTI grants in some industries, and 100% in a number of instances. 3. The use of relative TSR as the sole or key metric has also grown to nearly 50% of these performance plans. 4. The performance plans have replaced much of the portion of the LTI that used to be granted in stock options, which peaked at around 90% of grant value in 2000. While this substitution is due partially to the accounting rule change that happened in 2004, it has recently accelerated due to the ISS/SOP issues discussed. 1. INCENTIVE EFFECT: It is not directly under the control and often even the influence of management and the board, as it requires the full knowledge of 3 year TSR results for the peers. Thus management literally does not know definitively how it is performing in its incentive plan until the last day of the performance period. 2. HIGHER VOLATILITY OF PAYOUTS: Since a target payout typically requires beating the median relative TSR, the probability of payout at target is theoretically 50% --the same theoretical value of a performance plan with operating metrics--but with much higher volatility cycle to cycle. In addition, if TSR is used to both determine the grant levels (made at year end) and whether any shares are earned, the value of the compensation package can swing wildly and deviate from the company’s financial results. As a result, even long term successful companies could miss the relative median for several performance periods even as their absolute TSR remained in an upward trend. 3. NOT MOTIVATIONAL: Other metrics would likely be superior in motivating executives, implementing the strategy and creating long term shareholder value. 4. RISK TAKING: Some research indicates that in order to beat the median relative TSR over a given period a company would need to take on above median risk. This is not desirable in general and certainly not in the context of the 2008 financial crisis. 5. DISPUTED METRIC: Clearly experts disagree over what the ideal metric should be. As recently as March 2013, the Fed disclosed that relative performance metrics for the major banks was unsatisfactory. Some experts believe that a “balanced scorecard” of metrics is superior to TSR. 6. DISAPPOINTMENT IN THE UK: Investors in the UK have required for 10 years that relative TSR be the key metric in stock incentives. This has neither improved corporate performance, reduced excessive risk taking, nor reduced executive pay. In fact, the executives have found this so nonmotivating that cash compensation has increased dramatically over the years and the gap between UK and US CEO pay has narrowed. 7. PROBLEMATIC STRATEGY: Most importantly, homogenization of incentive strategy has similar risks to homogenizing business strategy. One of the key success factors of capitalism is that it encourages diverse business strategies which yield overall economic success with lower risk. If the regulators are wrong about which strategies that they encourage are successful, the results could be harmful for the economy. In the current governance environment (ISS, SOP, etc. ), there is no trivial solution to this conundrum. While more than 97% of thousands of companies have had a successful SOP vote, hundreds of companies face uncertainty each year leading up to their SOP vote results and failing a SOP vote is not an option. But motivating the executive team to create shareholder value is essential. As such, there should be balance between making changes to improve the probability of a successful SOP vote, which often means incorporating the views of ISS, and maintaining strong alignment to the business strategy through clear, cost effective pay programs. While there are no guarantees for a successful SOP vote, superior performance (based on year-end TSR) and strong demonstration of pay-performance alignment are the foundation of well-designed executive compensation programs. The integral role of performance makes it critical for companies to assess the actual/realized pay and potential realizable pay (from outstanding incentive awards) to ensure the amounts earned or current values are commensurate with internal performance results and relative to a relevant group of companies. In this regard, a wide range of incentive designs, performance measures and vesting/performance periods may result in a company achieving (and sustaining) strong pay-performance alignment, while directly supporting its business strategy and talent needs. 1. Understand the perspective of the company’s largest shareholders and proxy advisory firms, particularly ISS. In most cases, companies will decide not to “outsource design to ISS”, but to instead consider external perspectives as one of several inputs for the executive pay program. 2. Ensure the company’s executive compensation philosophy and incentive strategy are best aligned to its business strategy. 3. Determine the appropriate peer group or groups to use for CEO and executive pay benchmarking. At a minimum, a company should monitor the CEO pay levels of the companies likely to be used by ISS (recognizing that ISS uses total pay, as reported in the Summary Compensation Table, and typically assigns a higher value to stock options). 4. Evaluate the impact of current incentive plan measures and potential other metrics for correlation with shareholder value creation for the company and its peer group. 5. Determine as part of the incentive strategy the appropriate incentive metrics, including if relative TSR should be used, and, if so, its role (modifier, gatekeeper or separate measure) and the employees impacted (officers only or a broader group of executives). 6. Balance, if relative TSR is used, its portion of the LTI performance plan opportunity with financial/operating metrics. 7. Assess whether the regular annual LTI grants should be made at the end of the current year and, if so, develop guidelines regarding the potential application of current year’s performance on the grant levels. 8. Determine the need and role of other pay elements. 9. 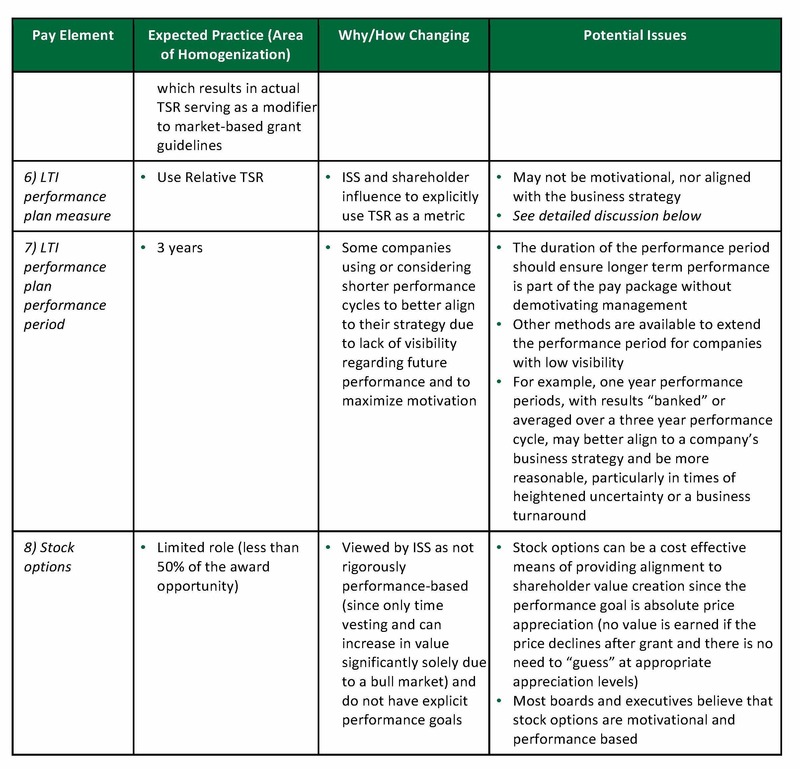 Explain the business strategy and executive pay programs clearly in the proxy CD&A, including realizable pay and recent incentive payouts relative to shareholder returns, particularly if relative TSR is not an incentive plan measure. 10. Dialog regularly with the company’s largest shareholders to ensure understanding of the executive pay program, particularly if the company retains practices that are less prevalent or may be viewed by some as inconsistent with the areas of convergence (as summarized above). In the end, homogenization of pay program design may be appropriate in some areas, but most companies will likely conclude it remains appropriate to design the executive compensation program to best achieve their business strategy and talent needs.